Over 100 high-achieving young people, adults and their proud families gathered in Poole on Monday 12th October for Poole Scouts’ Awards Night. 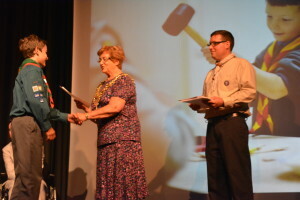 92 youngsters were awarded their Chief Scout’s and Duke of Edinburgh Awards. Around 20 leaders were given long service awards and 5 leaders presented with their Wood Beads, the mark that a leader has completed all their training. The Mayor of Poole presented certificates to all the Beavers, Cubs, Scouts and Explorers to recognize the hard work they have put into their Chief Scout Awards, the highest award that they can gain in each section. To achieve the awards they have had to complete challenge awards including leadership, expeditions and creative work.